For the first half of this book, the reader is treated to a depiction of Arnold that seems like he was a very misunderstood but likeable man. He seemed a true Patriot fighting against the British before the war even begins by joining in the Boston tea party and doing all he could to avoid the paying taxes he felt were unfair by smuggling goods into the country. And he joined the military to fight the British and was made an officer even though he knew nothing about military strategy. The second half of the book makes you see why he was not liked by many. The people from his hometown in Connecticut loved him, but they viewed him as a hero. Others saw the man who was rude and unethical. I ultimately didn’t find anything to admire about Benedict Arnold except for his bravery in the face of battle. Truthfully, he wasn’t so much brave as foolhardy. It turns out that he was a rather astute military tactician, and he certainly was a favorite of his soldiers. He never asked them to face dangers that he wasn’t willing to face himself, and even threw himself into the battle of Saratoga in which he was not supposed to be anywhere near the action. Arnold was a glory-seeker just like many of the other top generals of the time. He wasn’t given as much credit by Congress as he deserved for the successes he had in battle. Because he was always looking for accolades, jealousy by his commanding officers kept them from giving him as much or any credit at all when they reported on the battles they led. Despite all of these commendable qualities as a brave man, he was not admirable in so many other ways. And he was personally not a very nice man. Benedict Arnold was put in charge over Philadelphia by General George Washington in 1778 after the British abandoned their occupation of the city. Washington could not have picked a much worse candidate. Arnold had no political acumen, and Washington specifically stated that that is what would be required of the military leader in Philadelphia. There were all kinds of civilian toes not to be trod on that Arnold made no attempt to avoid. He disregarded civilian leaders as unimportant and made every attempt to better his personal situation with complete impunity. He made himself richer than he was before by taking advantage of his position, buying goods from stores he closed to the public, using transport vehicles for personal trade that were supposed to be used only for military purposes. It is such an irony that he faced a court martial trial at the very time he was plotting to betray the American forces to the British. He received a reprimand because he had practiced poor judgment while being in charge of Philadelphia, but he was found innocent of any criminal charges. But receiving even a reprimand enraged him because he felt he should be found innocent of all charges. What gall this man had! It was by sheer bad luck that his plan to betray the American forces was found out before the plan could be implemented. And a British officer was hanged as a spy for participating in the plan while Arnold got away. That just makes me mad because it was Arnold was doing the whole thing for money, not because of his principles. Okay even if he had been doing it for his principles I would still be mad. The book is very informative and interesting although it drags in places. 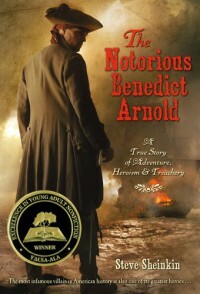 I would definitely recommend it to learn about the life of Benedict Arnold, and you too can hate him as a traitor as many British and all Americans did at the time.